Something difficult to comprehend, best left to experts? When I was teaching middle school, I vacillated between immersing my students in lived poetry units (modeled on Sharon Creech’s beautiful verse novel Love That Dog) and avoiding poetry like the proverbial plague. I guess I felt freer to teach poetry when my students were in grades 7 and 8; there, we played and experimented with form, with mimicry, with moments of truth and beauty, or we just wrote plain silly acrostic poems. But there was a problem. I came to realize that while I might be teaching my students how to experience poetry through writing, I wasn’t teaching them the “proper” form of poetic analysis required on state tests. I felt like I was failing my students, so I changed course when I changed my teaching context, moving up to the high school and into the weeds of analysis. We read the poems out loud, but we rarely went deeper than these very rote forms of analysis. We never made connections between the poems and our lives. And we never, ever wrote poetry. I don’t know why it never occurred to me that these slightly older adolescents would have been able to find the same joy, the same expression, as my young tweens if they had been given the space to approach poetry creatively, as both readers and poets. I wonder if, first, I needed to be able to see myself in both ways. but the words don’t lie. If I had the chance to go back and do it all again (anyone with a time-turner out there? ), so much would change about the way I’d approach poetry in the classroom. For starters, I would hand my baby-teacher self a copy of Stephen Fry’s The Ode Less Travelled: Unlocking the Poet Within. Reading this text for context and framing would be of immeasurable help before jumping into an attempt to convey the artistry of poetry to my adolescent students. Fry’s definitions and explanations are short and rich, with lots to unpack. Perhaps students could work together to create their own glossary of poetry, complete with examples from their favourite poets. Next, I would challenge myself to integrate poetry into every unit. This time, however, we wouldn’t only approach poetry through analysis. We would read Tennyson’s “Ulysses” while discussing The Odyssey, and then I would invite students to write a stanza or two from the perspective of another character, such as Penelope or Calypso. This time, we would write poems modeled after the exemplars I would weave into the unit, and we would spend far more time listening to poetry. I might begin with the lovely recording of Naomi Shihab Nye’s “Gate A-4”, which you’ll find with suggestions for integrating the poem into the classroom here. Finally, I would take the wild abandon of the creative writing poetry portfolio I taught in the middle grades and bring it forward, explicitly teaching, modeling, and practicing the art of crafting a poem with my students, regardless of grade level. I would bring in readings from Susan Wooldridge’s Poemcrazy: Freeing Your Life with Words, and invite my students to think more deeply about poetry as art. We would play with words and forms, experimenting together to make shared and unique meaning of the conversations and contexts within and beyond our classroom. Start small: Find one poem that you love that connects to a theme you are already exploring in your classroom, and offer it to students. If you don’t feel up to teaching analysis just yet, offer the text to your students as a conversation starter. Invite them to reflect and respond personally before digging into language and syntax, metre and structure. Poetry can be taught in baby steps, and not every poem we bring into the classroom requires deep analysis. Use poetry in unconventional ways: My favorite is to integrate free-verse poetry into brainstorming for other writing assignments. After students make an idea list, invite them to rearrange the words and add verbs to create something more cohesive, something that might become a brainstorming poem. You could also experiment with found poetry during a novel study, inviting students to “find” a poem within the words of the narrative. Or, you could integrate a verse novel into your class. Verse novels can be an excellent way to bring poetry into the classroom on more familiar terms; analyzing plot and theme work just as well in a verse novel as in a prose novel, and verse novels have the added benefit of lots of comforting white space (something that appeals to reluctant readers). Don’t be afraid! If you approach poetry playfully, you will likely be surprised at the depth and breadth possible in the encounter. Sometimes, we take poetry (and ourselves) just a bit too seriously. Embrace the word play, and scribble your own poems, as well! Glimmers of poetic possibility were present in my teaching practice all along: there were a number of students who opted to respond to Romeo and Juliet in verse, rather than visual form, when I gave them the opportunity to create a work of art inspired by the play. There were the students who dove head-first into spoken word poetry (even as I felt I did not know enough about that particular art form to teach it), boldly signing up for Poetry Out Loud and advancing far beyond the confines of our school with their performative power. And I offered George Ella Lyon’s “Where I’m From” poem as a model for brainstorming and pre-writing a teaching philosophy last semester to the future teachers in my care. This in turn prompted them to produce some of the most heartfelt expressions of their call to the profession that I’ve yet encountered. In hindsight, my favorite poetic moment from my teaching career stems from a novel-in-verse. As a passionate reader, I made it my personal crusade to hook students up with books that would grab them, and I frequently recommended verse novels to my reluctant readers. For one young student, these proved the gateway I had hoped, and she transformed in short order from someone who had proudly told me she hated to read on the first day of class into one of the most voracious readers in the grade. There’s power in poetry that extends beyond analysis. If, as Teresa Cremin and Terry Locke advocate in Writer Identity and the Teaching and Learning of Writing, a teacher’s ability to conceive of themself as a writer is a fundamental element to that teacher’s ability to teach writing, then perhaps teachers who want to embrace poetry instruction must first be able to claim the title “Poet” for themselves. 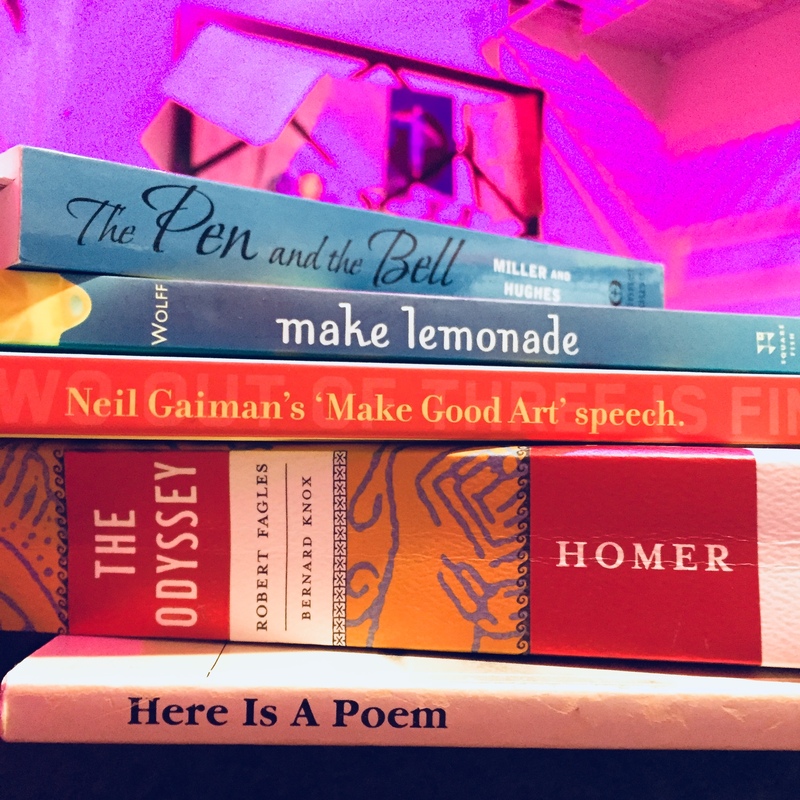 If we want our students to be able to go beyond analysis and explore the forms and functions of poetry from a space of creative play, we certainly need to encourage them to try on a poetic identity. Perhaps in embracing our own poet-selves, we can model another side of poetry instruction in our courses. Here’s a secret about poetry, one that it took me over three decades of scribbling to learn: anyone can BE a poet. Creech, Sharon. Love That Dog. New York: Harper Collins, 2001. Cremin, Teresa, and Terry Locke (eds). Writer Identity and the Teaching and Learning of Writing. London and New York: Routledge, 2017. Fry, Stephen. The Ode Less Travelled: Unlocking the poet within. London: Hutchinson, 2005. Wooldridge, Susan G. Poemcrazy: Freeing your life with words. New York: Broadway Books, 1997. Jen McConnel is an author, researcher, and teacher, and she is currently at work on her PhD at Queen’s University of Kingston, Ontario. Connect with her on Twitter @Jen_McConnel.